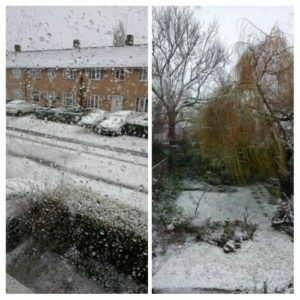 I was very glad on Wednesday that it was a rest day for me, as I looked out of the window and saw more snow. I had some work to do, so decided to get on with that as I had nothing planned. 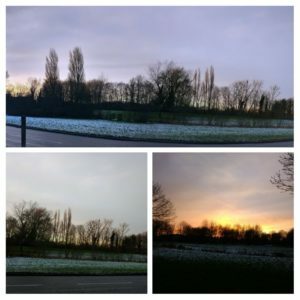 I did get super cold sat at my desk though (and a dreadful case of “mouse-hand” – which is what we call it when your right hand goes so cold from being so very still sitting on the mouse for hours on end), so after lunch I walked the long way to town- 5 miles in all. The pavements weren’t too bad but the wind was so cold. I did get treated to another gorgeous sunset- the colours at the moment are so beautiful. As I got to town the sun was properly setting and loads of people were taking out their phones and snapping away. 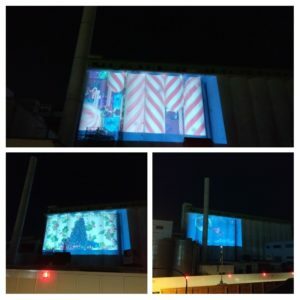 I also got to see the giant projector that is on the old Shredded Wheat factory (they have finally started to demolish it)- the whole thing is huge and the projection shows various animations. It’s very clever as the spinning candy cane things were lined up with the columns of the building. Once home in the warm I made some little Christmas pudding truffles- we had quite a bit left over, and I’d seen this recipe on the internet (a Nigella one I think)- basically mix up the crumbled pudding with some golden syrup, melted chocolate, and rum or something (I left that bit out), then decorate with melted white chocolate so they look like little puddings. I had some bags and tags left over from the fudge so I parcelled them up for my parents and my cousin. 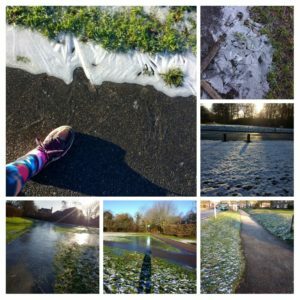 On Thursday I went out for a run in the morning, but the pavements were so icy that I spent a lot of it walking. I had wrapped up well, and so I didn’t mind just spending the time getting fresh air and listening to podcasts. It was so pretty (I love seeing the different types of ice and the patterns made by it) but at some points huge puddles had frozen into smooth sheer ice- I couldn’t smash some of it when standing on it, so it was pretty thick and very slippery. Then I went to see my cousin and his wife- they don’t live far away but we don’t meet up that much (and as they are both teachers you would think we’d manage to meet up more in the holidays)- my parents went over too so we had a walk to a local pub for some lunch. It was so nice because I had no need to look at the time at all. On my way home I stopped to get some wood for our fire, and then went to get my car washed (a job that’s been on my list since the summer holidays…), and then after dinner we went to see Star Wars. I’m not a childhood fan or anything, but I quite enjoyed it (and I do like the little puffin things). On Friday I had another run- it wasn’t raining when I set off but by the time I was half way around the freezing sleety rain had started and it was not fun. Once home I got on with my favourite passtime- baking, and specifically, baking a stollen. It is a bit of a lengthy project, because you have to activate the yeast, make the dough, soak the fruits, let the dough rise, add the fruits, let it rise again, roll it out, let it rise (lots of rising going on), but the results are so good. Anything with marzipan wins in my book, and it must be my Austrian heritage that explains my love of all their festive traditions (gingerbread). One for us, one for my parents and one for Andy’s parents. On Saturday morning I was thinking of going to Panshanger parkrun, but Dad was time-keeping at Ellenbrook so I went there instead. I left a little late and on the short jog from the car park to the start, blasted by the freezing wind, I wasn’t feeling that inclined. I’d not been to Ellenbrook for a couple of weeks, and it was somewhat muddy! It’s a flat route, mainly through fields, but the paths had been covered in huge puddles, and as it’s sort of sandy (silty?) underfoot anyway, it was just boggy. The wind was crazy- we were promised in the briefing that by the end it would be a tail wind and that we would most certainly have earned putting our feet up afterwards. At one point it felt like I wasn’t moving as the wind was so strong, and at other times you’d aim for your foot to land somewhere, and the wind would whip it away and then your foot would end up in another puddle. By the end of the first little loop I’d managed to soak both feet by going into puddles up to my ankles. My poor (chilblain-prone) feet! M brother came along too, so we ran together for a bit which was good, but in the end we were concentrating too much on avoiding the biggest puddles to chat! After finishing (30.49) I put my coat on and chatted to Dad for a bit. I had a stollen for him in the boot of my car, so I needed to wait. The final runner came in past the hour mark, and then we helped packing the table away and things, so I was pretty cold by the time I got back to the car. I actually ended up cleaning my trainers later on, as I wanted them to be dry for Monday (new years day). So much mud came off them- I usually only clean the soles as they need the mud gone for grip, but ended up cleaning the tops too. We spent late afternoon at my parents watching football. On Sunday we headed to Milton Keynes. The original plan was to pop to Ikea (is that even possible) to get some shelves for our living room, pop to the shops (I wanted to get some new shoes and have a 50% discount for Sweatshop) and then have a walk around Willen Lakes. Well, even though we felt fairly quick, by the time we’d finished (and in fact the Sweatshop was not in either shopping centre but by the snowdome so that meant a bit more of a wander) it was nearly getting dark and as the lap of Willen lakes is about 3 miles we decided to head home and save it for another day. 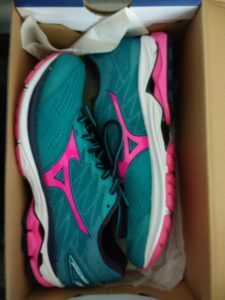 I did get new shoes though- I used to love Mizuno’s so thought I’d give them another go as they didn’t have any of the Asics that I liked. I did try on some Boosts as lots of people in the running club rave about them, but the ones I tried had uppers so thin they felt all stretchy and weird. I’m not one for new years eve- we watched a film (Moana- my choice) and then I got grumpy when the fireworks outside seemed to carry on until gone 1am- don’t these people realise I’ll be off to parkrun in the morning? New years day is the only day where parkrun hq let you run two events, and lots of events stagger their start times so that you can manage two. I’ve not done it before- last year we went out for breakfast instead as I was recovering from a bug, and the year before I ran one and my dad and brother ran the later one (but I think that was 10am at St Albans so I don’t think I would have made it there on time). I have run an unofficial double for the Ellenbrook test event- Dad and I ran Panshanger at 9am and then hot-footed it over to Hatfield for the 10am test event. There was lots of activity on the parkrun tourist page, and of course it could be a good way of visiting two new events. I briefly considered this, but the nearest events that I’ve not done are not that local (or in London), I didn’t want to be twice as stressed about driving somewhere that I’ve not been to before, and at new events I quite like to hang around for a bit and take photos. I wanted to do the double properly, so decided that my two closest (and favourite) events would be the best bet. Panshanger started at 9am, so I parked away from the start (to give me an easier getaway). I met up with a few people from my club (who all accused me of being far too cheerful- maybe because I don’t drink?) and as we were all doing the double we’d agreed it would be a sociable run and no fuss about times. Panshanger has had permanent markers installed (see the pic above)so I took a few photos on the way around. It can be fairly muddy, but it wasn’t too bad- just one section through a field where you couldn’t really get much of a grip. I had packed spare socks but in the end I didn’t need to change. Then it was off to Ellenbrook, which was starting at 10.30. By the time I got my chip scanned and walked back to my car (it’s half a mile from the start), it was 9.45, and it is a 15 min drive, so I would not have made a 10am start, but the wait until 10.30 meant I did get cold. I’d taken my coat so I put that on and walked around to the start- Dad was there (giving out tokens) and he said that he could tell all the people who’d run already with the mud up their legs. It was nothing compared to what was to come! There was someone dressed as a stag to launch something about the Herts year of sports- the person actually ran the whole thing in the costume which was crazy! More rain since Saturday meant that the puddles were even bigger- we were told in the brieding that it would be the muddiest parkrun of the double, and that was certainly correct. I had mud splattered all up the front of my top as well as a total coating on my legs. After one foot ended up in a puddle it seemed pointless to try and avoid them any more. It was good fun though- the group of us that had run at Panshanger stayed together for Ellenbrook too- reaching the taxi-way for the final km felt so strange to be running on a hard surface. I thought Ellenbrook would be busier (I knew some people only coming out for the later one) but in fact there were 303 at Panshanger and only 194 at Ellenbrook. I think some people went to a different second one ( St Albans was also on at 10.30). Anyway, it was fun, but I was really tired after. I think having the gap between them made it much worse as I got quite cold in the middle, and of course neither route was easy due to the mud. Also, as I finished running at about 11am, I then had to get my chip scanned and walk back to the car, so I got home at about 11.45- too late for breakfast! I’m glad I did it anyway- it was a fun way to start the year and of course a couple more towards the next milestone. Panshanger time- 32.58 and Ellenbrook 30.36, for parkrun numbers 132 and 133. 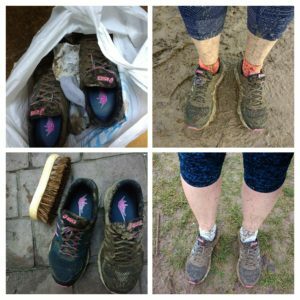 Clockwise from top right- shoes and socks after the double, after Ellenbrook, after Panshanger, one clean and one dirty shoe mid-clean! At least they have a week to dry out before the next parkrun! After a bit of brunch (I had a shower, then sat on the sofa under a blanket trying to warm up) we went to the cinema to see Molly’s Game, which I thought was very interesting and well-done (if a little tiring to watch- they speak to fast! However, when I needed to stand at the end my legs were so stiff- bad move! 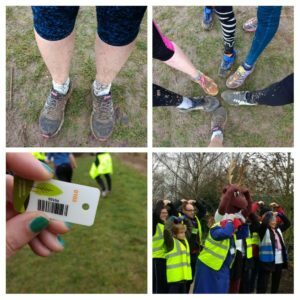 Did you manage a parkrun (or double) this year? 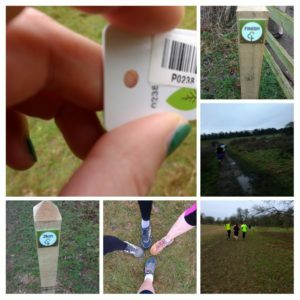 Do you like visiting new parkruns? Have you seen any good films recently? 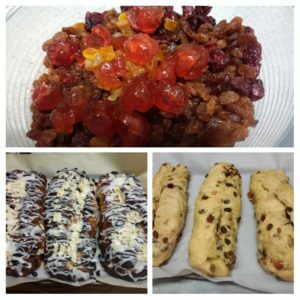 Are you a fan of stollen? We managed a double this year then followed those up with a local fun run that has been going for over 30 years! A great local challenge that lots of people have taken to doing. There are loads of parkruns in Scotland but visiting different ones can take a bit more commitment as not many are within 30 minutes of me. I do like the idea of trying different ones when the opportunity arises though. Yes, once the parkruns get a bit further away it’s more of a morning to visit somewhere new, instead of just a bit of the morning. The race on top is very impressive! 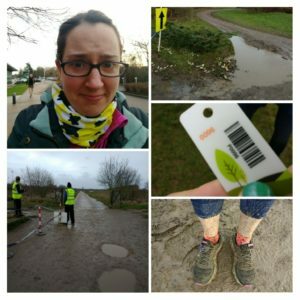 Well done on your parkruns! It’s nice to get so many extra parkrun “points” as it were in a short period of time. The stollen sounds and looks delicious. I adore stollen and was glad to find a very affordable and tasty one from Lidl (I think it was £3? Which was far cheaper than other supermarkets!) 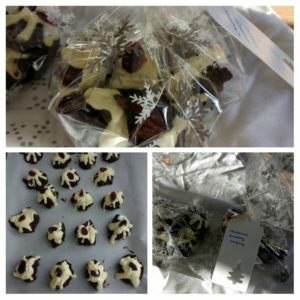 Also, love the idea of Christmas pudding fudge! Good to hear about the film. That one peaked my interest too! I wish I could have done parkrun this year but I played it safe with my calf. Otherwise I would have done Netley (my home one) and then I was going to meet my dad at Lee (Lee is closer to home than Southampton which was the other option). My dad had a sore knee anyway and didn’t fancy power walking in the rain so it worked out nicely (besides, we went for the swim thing anyway). I have just read your swimming post- craziness! It’s nice to kick off the new year with something active, so it sounded like a good alternative. Yes, it was a good film, and even though I feel like I’ve seen the adverts loads of times, I didn’t know much of the story so it was more interesting that way I think.